Marcus Valerius Martialis (known in English as Martial /ˈmɑːrʃəl/) (March, between 38 and 41 AD – between 102 and 104 AD) was a Roman poet from Hispania (the Iberian Peninsula) best known for his twelve books of Epigrams, published in Rome between AD 86 and 103, during the reigns of the emperors Domitian, Nerva and Trajan. In these short, witty poems he cheerfully satirises city life and the scandalous activities of his acquaintances, and romanticises his provincial upbringing. He wrote a total of 1,561, of which 1,235 are in elegiac couplets. He is considered to be the creator of the modern epigram. The success of his countrymen may have been what motivated Martial to move to Rome, from Hispania, once he had completed his education. This move occurred in AD 64, in which Seneca the Younger and Lucan may have served as his first patrons, though pertinent details have been lost to the mists of time. Not much is known of the details of his life for the first twenty years or so after he came to Rome. He published some juvenile poems of which he thought very little in his later years, and he chuckles at a foolish bookseller who would not allow them to die a natural death (I. 113). Martial had neither youthful passion nor youthful enthusiasm to precociously mold him a poet. His faculty ripened through the seasons with careworn experience and with the time earned knowledge of that social life which was both his theme and his inspiration; many of his best epigrams are among those written in the twilight of his last years. From many answers which he makes to the remonstrances of friends—among others to those of Quintilian—it may be inferred that he was urged to practice at the bar, but that he preferred his own lazy, some would say Bohemian kind of life. He made many influential friends and patrons and secured the favor of both Titus and Domitian. From them he obtained various privileges, among others the semestris tribunatus, which conferred on him equestrian rank. Martial failed, however, in his application to Domitian for more substantial advantages, although he commemorates the glory of having been invited to dinner by him, and also the fact that he procured the privilege of citizenship for many persons on whose behalf he appealed to him. The earliest of his extant works, known as Liber spectaculorum, was first published at the opening of the Colosseum in the reign of Titus. It relates to the theatrical performances given by him, but the book as it now stands was presented to the world in or about the first year of Domitian, i.e. about the year 81, by him. The favour of the emperor procured him the countenance of some of the worst creatures at the imperial court—among them of the notorious Crispinus, and probably (certainly it is thrilling to consider) of Paris, the supposed author of Juvenal's exile, for whose monument Martial afterwards wrote a eulogistic epitaph. The two books, numbered by editors xiii. and xiv., and known by the names of Xenia and Apophoreta—inscriptions in two lines each for presents—were published at the Saturnalia of 84. In 86 he bore for the world the first two of the twelve books on which his pendulous and sterling reputation rests. From that time till his return to Hispania in 98 he published a volume almost every year. The first nine books and the first edition of Book X. appeared in the reign of Domitian; Book XI. appeared at the end of 96, shortly after the accession of Nerva. A revised edition of book X., that which we now possess extant, appeared in 98, about the time of Trajan's entrance into Rome. The last book was written after three years' absence in Hispania, shortly before his lamentable death, which happened about the year 102 or 103. These twelve books bring Martial's ordinary mode of life between the age of forty-five and sixty very fully before us for leisurely consideration of a Sunday afternoon. His regular home for thirty-five years was the bustle of metropolitan Rome. He lived at first up three flights of stairs, and his "garret" overlooked the laurels in front of the portico of Agrippa. He had a small villa and unproductive farm near Nomentum, in the Sabine territory, to which he occasionally retired from the pestilence, boors and noises of the city (ii. 38, xii. 57). In his later years he had also a small house on the Quirinal, near the temple of Quirinus. His final departure from Rome was motivated by a solemn weariness of the burdens imposed on him by his social position, and apparently the difficulties of meeting the ordinary expenses of living in the bustling metropolis (x. 96); and he looks smilingly ever forward to a return to the rosy scenes familiar to his youth, apparently. The well-known epigram addressed to Juvenal (xii. I 8) shows that for a time his ideal was happily realized; but the more trustworthy evidence of the dry prose epistle prefixed to Book XII. proves and that he could not live happily away from the literary and social pleasures of Rome for long. The one consolation of his exile was a lady, Marcella, of whom he writes rather platonically as if she were his patroness—and it seems to have been a necessity of his being to have always a patron or patroness—than his wife or mistress or harlot or muse or shrewish burden. During his life at Rome, although he never rose to a position of real independence, and had always a hard and close struggle with poverty, he seems to have known everybody, especially every one of any eminence at the bar or in literature (friend to all).In addition to Lucan and Quintilian, he numbered among his manifold friends or more intimate acquaintances Silius Italicus, Juvenal, the younger Pliny; and there were many others of high position whose society and patronage he relished. The silence which he and Statius, although authors writing at the same time, having common friends and treating often of the same subjects, maintain in regard to one another may (nay must certainly) be explained by mutual dislike or want of sympathy or healthy rivalry or simple disgust. Martial in many places shows an undisguised contempt for the artificial kind of epic on which Statius's reputation chiefly rests; and it seems quite natural in the mind of an eminent litteraturist that the respectable author of the Thebaid and the Silvae should feel little admiration, nay perhaps even outright contempt, for either the life or the works of the populist and unsophisticated bohemian epigrammatist. 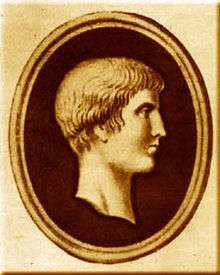 Pliny the Younger, in the short tribute which he pays to him on hearing of his death, wrote, "He had as much good-nature as wit and pungency in his writings" (Ep. iii. 21). Martial professes to avoid personalities in his satire, and honour and sincerity (fides and simplicitas) seem to have been the qualities which he most admires in his friends. Some have found distasteful his apparent servile flattery to the worst of the many bad emperors of Rome in the 1st century. These were emperors Martial would later censure immediately after their death (xii. 6). However, he seems to have disliked hypocrisy in its many forms, and seems to be free from cant, pedantry, or affectation of any kind. ↑ Not necessarily March 1, on account of the habit of celebrating one's birthday on that day if one had been born during that month: D. R. Shackleton Bailey, Martial. Epigrams. Edited and translated by D. R. S. B. (Cambridge (Mass. ): Harvard University Press, 1993), vol. I, p. 1 n. 1. ↑ Jo-Ann Shelton, As the Romans Did: A Sourcebook in Roman Social History (New York: Oxford University Press, 1988), 65. Complete Epigrams (in English, 1897 edition) at The Tertullian Project – actually incomplete: scatological and sexually explicit material is left untranslated.